Once I figured out the stripe pattern for this Crochet Modern V-Stitch Blanket in Red, White and Blue, I got to work and loved making it! And then half-way through making it, it started to look very Tommy Hilfiger-ish and then I loved it more! What a cute baby blanket gift idea! Can you see it? A darling little baby Tommy Hilfiger outfit to go with the blanket? Anyway, that’s what I’m thinking when I either end up giving this one away, or hopefully get to use it myself for one of those eventual grandbabies! 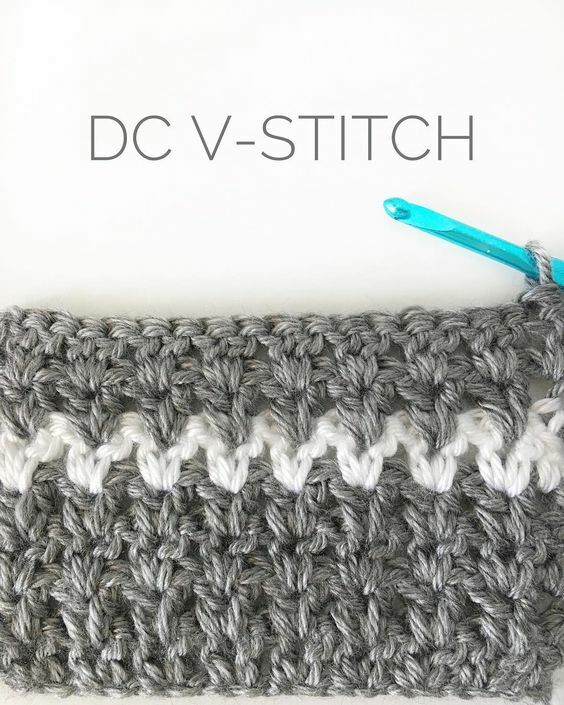 So I’m using a classic V-stitch pattern. Nothing fancy about the stitch except the results! Look at how just one row of a color change looks like zig-zags. Awesome. I finished it up with a somewhat solid looking border, super easy, unless you have tension problems like I did, but I’ll get to that later. Look really close at the above picture, if you can tell, 2 double crochet stitches (DC) are worked in between the two double crochets of the row below. That’s how you are going to be able to see where to insert your hook. And then, at the end of each row, you will just be working one DC into the top of the turning chain. But now let’s have that chat about the border. I got a little hasty in turning each row and my chain 3’s turned out to be too loose. That threw the tension off on the sides of the blanket. Which in turn, made the border ripple when I started working the first round. So here is what I wish I would have done, chain 2 instead of chain 3 when I turned. Or pay very close attention to the height of my chain 3’s. They should not be taller than the posts of the double crochets in the row you are working. I hope that tip helps you if you wish to finish the blanket in the same manner. (An ad-free PDF of this pattern is available on the Daisy Farm Crafts Etsy shop. Free pattern below). Finished size of the blanket 36 x 34 inches. ROW 1: In the fourth chain from the hook work 2 DC. SK the next chain space, *DC 2 in the next chain space, then SK the next chain. * Repeat * across the row and work one DC into the very last chain. Chain 3 and turn. (This will count as your first DC) on the next row. ROW 2: Work 2 DC in between each pair of DC from the row below. Insert your hook in between them. Repeat across the whole row and end with one DC into the top of the first chain three. Chain three and turn. Continue repeating row 2 for the rest of the blanket, (I’ll list the color changes in a second.) Here is a close-up picture of the stitch. You can see that that two double crochets always go in between the two double crochets from the previous row. Repeat from the * one more time, and then end with 7 rows red, 1 row white, 7 rows red. Now for the border. Weave in all the ends first before you get started. Start in the upper left-hand corner of the blanket, where you will be working down the left-hand side of the blanket. With white, pull up a loop and chain 3. (This counts as a DC.) DC two more times in that corner. Work 2 DC for each row of V-Stitch. Check your tension and see if you need a smaller hook–you’ll know if your blanket is rippling on you. In each corner work 6 DC. On the ends of the blanket, work 2 DC in between each group of V-stitches. When you return to the start, DC 3 and slip stitch to join, CH 1 and turn. SC in each stitch around, working 3 SC into the 3rd DC of the row below to round the corner. SL ST to join the round, CH 2 and turn. HDC in each stitch around, working 3 HDC into the middle SC stitch of the row below in each corner. SL ST to join the round and CH 1 and turn. Repeat rows of SC and HDC two more times. Tie off and weave in all ends. BLOCK your blanket to get it looking awesome by pinning the blanket as straight as you can to a towel, or foam mats if you have them. Use a spray bottle and wet the border and finger press it as close to perfect as possible. Massage those stitches to get them just right! Let the blanket air dry. Unpin and now go find that perfect little baby outfit to match the blanket! I think this Crochet Modern V-Stitch Blanket in Red, White and Blue will be perfect for a July baby for sure! Perfect for the Fourth of July parade. If you choose to follow me on Instagram, I share the blankets as I’m making them, mistakes and all. I figure you can learn along with me as I try new stitches and play with new designs. It’s definitely made my little “crochet it and they will come” journey a lot more fun to have you all along.